Key Largo melded with Quentin Tarantino’s bravura scenes in Inglorious Basterds and his crackling dialogue in Reservoir Dogs. I had the pleasure of watching this picture on Christmas Day in 70mm at the AFI Silver Theater, complete with an overture and an intermission. The latter occurred after 1:46 minutes, and I remarked to my son that the film was flying by, particularly so because almost all that had occurred was conversation. Obviously, a Tarantino film cannot subsist on talk alone, but when the violence occurs, it is supported by the rich, if broad, characters developed beforehand (unlike in Django, where the carnage at the end felt like an indulgent spasm, revealing an insecurity at what came before). It’s one of the best films of the year and it’s also one that should not be in any way spoiled by a plot summary or any other commentary that could lessen the fun. Accordingly, I’ll make my review brief and non-specific in the form of a few notes. First, Spike Lee once disrespected Samuel L. Jackson when the latter was a working character actor and the former was the auteur du jour. Lee is also made apoplectic by Tarantino, who wades into race with a daring and incisiveness that obliterates Lee’s rote and easy observations. As it turns out, Lee and Jackson have achieved a rapprochement (they do commercials together), but any rift between Lee and Tarantino is settled by Jackson (“Spike saying, ‘I’m not going to see Django because it’s an insult to my ancestors’? It’s fine if you think that, but then you have nothing else to say about the movie, period, because you don’t know if Quentin insulted your ancestors or not,”). This is an ensemble picture but it’s Jackson’s picture (though costars Walter Goggins and Jennifer Jason Leigh give him a run for his money). Second, Tarantino masterfully blends genre, history, comic books and violence, but sometimes, it is to the detriment of his narrative. Not here. When the necessary resolution explodes, it’s almost a disappointment because you know there will be less talk. Tarantino’s script is razor-sharp, hilarious, suspenseful and a brilliant mix of modern pop culture and historical grievance. It’s really something. Third, I generally do not read any reviews or commentary about a film before seeing it or writing my own review, and I did not do so here. 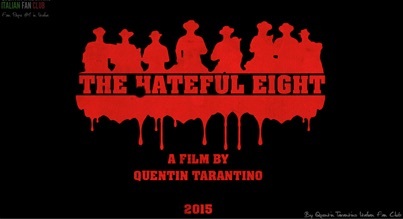 But I presume there is the same hullabaloo about Tarantino’s liberal use of racial and sexist insults. All I can say is that he uses them beautifully, like David Milch in Deadwood. This is how you would expect low, dangerous comic book characters who steal and murder to parlay. Any objection is likely coming from the same humorless prigs or their progeny who objected to the hyenas in The Lion King because they were villains voiced by minorities. In fact, in creating a movie depicting a roomful of lethal people who must sleep with one eye open as they brave a blizzard and their own treachery, opprobrium aside, it’s one of the most egalitarian rooms you’ll find in film.